Boston Bruins General Manager Don Sweeney certainly has his hands full with a list of restricted and unrestricted free agents to sign or not sign. With recent coaching changes throughout the organization, it seems the team is preparing to potentially add a few more players to the offensive depth with coaches that are already familiar with current prospect attributes. Two players that shouldn’t be retained for the upcoming 2016-17 season, in my opinion, are right wing Lee Stempniak, and center Chris Kelly. Both players are set to become unrestricted free-agents July 1st, and could be primary targets for shedding some cap space with the thought of landing a top two defenseman, something that the organization desperately needs after what’s been put on the ice the last two seasons. The 33-year-old Stempniak was acquired at the trade deadline for a second round pick in 2017, and a fourth round pick this year. That turned out to be a rather high price for a player who only saw 19 games for the Bruins, tallying three goals and seven assists, and posting 41 points with the Devils during the first half of the season. The tough thing for me about this deal is that the Bruins could’ve signed him before the season began. He was in Boston during the offseason working-out with the Bruins before the Devils signed him to a professional try-out agreement. The 11-year veteran had a cap hit of $850,000 last season, and although the salary is low risk, re-signing him hinders the progression of others trying to get a chance in the NHL. A return to Boston would prove that, while other teams are looking to run four lines of offensive depth, the Bruins would be moving in the opposite direction. Although center Chris Kelly’s role on this team has been very much appreciated, the 35-year-old was often injured in his five full seasons. Being a specialist on the penalty kill was one of the strong attributes to his game, but it seems the team is going younger as many current veterans are simply getting out-skated. Last season, Kelly missed 71 games with a fractured femur and was unable to return before seasons end. Since being acquired in a trade from Ottawa in the 2010-11 season, which brought the B’s to their first Stanley Cup in over 39 years, Kelly has appeared in 288 games for the Black and Gold, posting 43 goals, 58 assists for 101 points as a bottom-six forward. His cap hit of $3 million last season alone is a good reason for Sweeney to walk away from a new contract, or find a trade where he could get some value back with a later round draft pick in this years draft. Either way, the days of the aging veteran in Boston could be over, and the option to go with low salary cap players in the developmental system would be a better use of available funds to address concerns over the current roster. Two players that deserve promotions to roster spots, center Austin Czarnik and winger Seth Griffith, have both showed hard work and leadership in their roles with the AHL Providence Bruins. I’ve had the pleasure of watching both these players during their time with Providence, and they both should get a serious look over the offseason. They would be two great additions to a Bruins team that seems to rely heavily on a slow veteran core. The Bruins have had some luck with free-agents coming out of the NCAA, after finishing their collegiate commitments. 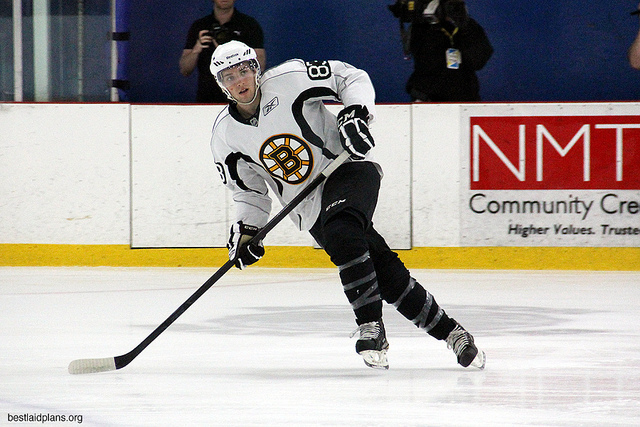 After playing in his last season with the University of Miami (Ohio) RedHawks, the B’s locked up center Austin Czarnik to an entry-level deal on March 31, 2015. Appearing in 159 games for the RedHawks he posted 46 goals and 123 assists for 169 points. The Bruin’s scouts should get a ton of credit for this find, as his first season of professional hockey with the Baby B’s, last season, exceeded many expectations. In his 2015-16 rookie season with Providence, the 5’9” 160-pound Washington, Michigan native appeared in 68 games, totaling 61 points (20G-41A) as a top-six forward on the team. Although he’s considered under-sized, and his game can be compared to Ryan Spooner, in my opinion he could be better. He would certainly be a nice fit for the departing Kelly, and his NHL cap number of $817,000 is a low risk, high reward number. Although the 23 year-old versatile forward has more to prove in his young pro career, I believe he’d be a great asset to a Bruins team that maybe going in the right direction with younger players. Known as a speedy offensive threat, he has exceptional vision on the ice, and has pro-level skills in all three zones. His passing skills, and ability to thread the needle, is a skill I’m most impressed with, and hope to see him showcase his skills during training camp in September. The 5’9”, 192-pound, Wallaceburg, Ontario native has been in the Bruins organization for the past three seasons, after completing a very successful junior career with the OHL London Knights. There was no question why the B’s were interested when they selected him in the 5th round (131st overall) in the 2012 entry draft. He appeared in 207 games with the Knights, compiling 102 goals and 129 assists for 231 points, helping the powerful Knights to back-to-back OHL Championships (2011-12 & 2012-13), and appearing in the MasterCard Memorial Cup twice. After signing an entry-level deal with Boston in April, 2013, the crafty right-winger has played in 165 AHL games for Providence, and has totaled 56 goals, 102 assists for 158 points with the B’s affiliate. Last season was a career best, as he put up 77 points (24G-53A), ranking him number one on the team, and second in league points. Griffith signed a one-year, two-way extension last week, worth a reported $625,000 annually. A full explanation of the Griffith signing can be read in last weeks release by Andrew Forbes of The Hockey Writers. This upcoming Bruins training camp will be very important for the 23-year-old, as he’s slated to start the year in the NHL. If, by chance, his game goes to hell, or the team is not all impressed with his skill level, the organization has the option to waive him and reassign him back to Providence. A move like that could be a costly one. He could easily be claimed because he would be a solid addition to the depth of any other team. Griffith is another player that has size issues, but possesses the amount of skill of everyday NHL players. His hockey sense is second to none, and he has great vision in all three zones. The way he sets up on the half-wall on the power-play, and his high level of thinking the game through, could be a great fit in Boston next season. He’s a player that would fit nicely on the bottom six-offense with some chances at a top-six role. Regardless of who’s staying and who’s going, it should be very interesting to see what direction the Bruins go after the last two failed attempts to reach the Stanley Cup Playoffs. It’s frustrating to think the team missed out on the postseason by single digit numbers. Once again the organization looks to “retool” or “rebuild” the roster to get back to the playoffs, where they had a seven-year appearance streak not to long ago.